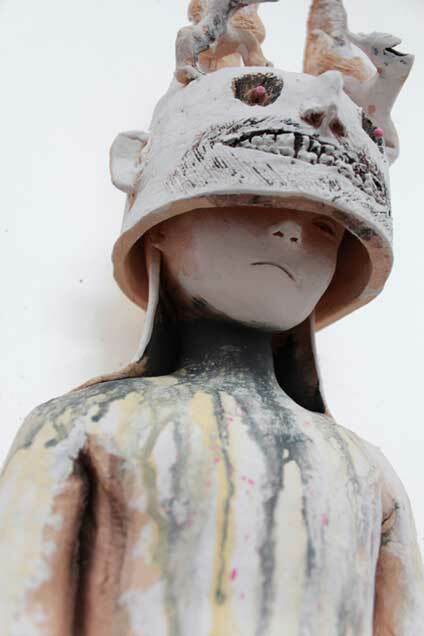 My ceramic sculptures are often the celebration of the irrational; a celebration of ideas, impulses, and desires that spring from the darker side of the subconscious. So instead of pushing away a thought and wondering, "Why did I think something so strange?‚Äù I celebrate it and turn it into a drawing or translate it into a sculpture. In general, much of my sculpture explores aspects of the human shadow; those which we deem improper, primitive and ultimately ‚Äúunfit‚Äù for modern society. These are aspects of ourselves we've learned to restrain in our youth, and continue to intentionally suppress as adults in order to create a more "ideal" person. Take for example, those who have learned to inhibit their playfulness or creativity. Although we intend to repress these aspects for the "better," without them the individual is not whole. As a result, people later in life may feel the need to get in touch with the repressed, but perhaps don't know how. My work highlights these aspects and puts them into the physical world; to give them a face and a set of eyes, so we can confront and better understand them. As a result I better understand myself. Joe Kowalczyk (Ko-v√§l-chick) is an award winning sculptor, painter, and illustrator that has been creating in the California Bay Area since he received his BFA in ceramics from California College of Arts and Crafts in 2006. Along with his studio practice, Joe fixes kilns, teaches ceramics, and cofounded a fine art gallery within the Oakland Art Murmur district.